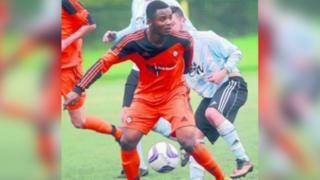 Tributes have been paid to an amateur footballer who was killed in a park on his birthday. Ismail 'Izzy' Mohamed, from Slough, died on Monday after being stabbed at Salt Hill Park on 10 July. His family said Mr Mohamed, who had played for non-league side Slough Town, was "a handsome kind humble young man, armed only with a Hollywood smile". Police have issued details of two cars they want to trace which were seen in the area at the time of the attack. Mr Mohamed had played semi-professional football before joining Real Milan, a side based in Burnham, Berkshire. A family statement given to the BBC by the club said: "His wide circle of male and female friends bridge every nationality, race, colour and religion." They also said he "warmed and touched the lives of everyone who crossed his path". Mr Mohamed was part of a group of men who were sitting on the skate ramps in the park when they were approached by three men. Police said he suffered life-threatening injuries and died in hospital three weeks after the assault, which was on his 24th birthday. Thames Valley Police say they want to anyone who saw a yellow Honda Jazz with the registration HN05 JDZ or a black or dark blue Mercedes C230 registered as HG53 UCE in connection with the attack. Two people have previously been arrested and released while inquiries continue. Another was released without charge.